There are 3 rivers that run parallel on the western side of the Lewis River. 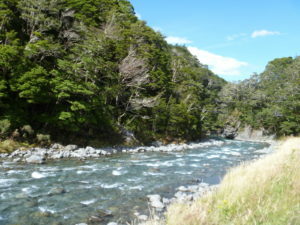 The Doubtful River is not the most scenic, or the most exciting, but it does have whio and potential in higher water. Thanks to Colin Kinnison for the information and photos for this trip page. 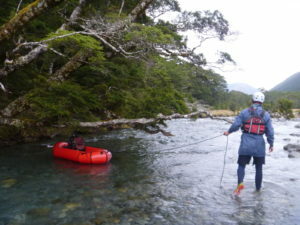 Take care when crossing the Boyle River, especially if you have waited for higher water levels to do this trip. 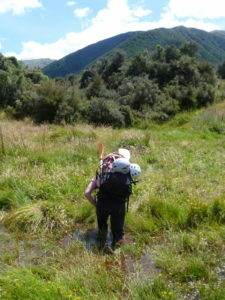 Follow the poled track on the true right of the Doubtful River across open flats to the bush. Here, pick up the track to Doubtful Hut. It’s a pretty dingy, mousy place to stay, but there is a nice campsite just beyond the hut on the track. 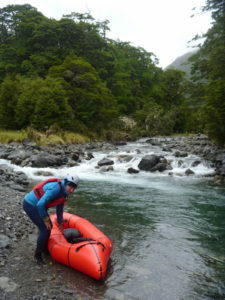 This is the best section of the river to packraft. 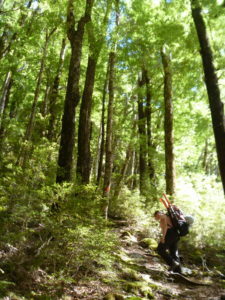 Continue up grassy river flats and sections of track until you reach the Doubtful–Doubtless confluence. 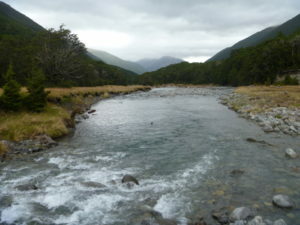 Cross the Doubtful River and then the Doubtless River to reach the Doubtless Hut on the true left of the river. 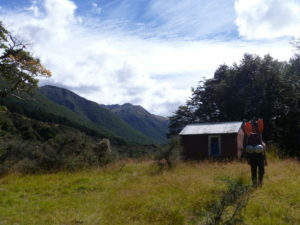 The 6 bed Doubtless hut was a nice, standard NZFS hut – a good place to stay. There’s more information about the huts, tracks and access points on the Doubtful Valley tracks and routes page on the DOC website. The Doubtful River is an open valley with mostly gravel races. There are some fun rapids up to grade 2 but at out low level there were significant patches of packraft dragging and bum scraping drudgery. In retrospect, the section from Doubtless to Doubtful huts will rarely have enough water unless there has been a decent amount of recent rain, which means the best put in would usually be at Doubtful Hut. The Hope River gauge at Glynn Wye, although it isn’t particularly close, provides somewhat of an indication. We paddled it at 0.64m, which was probably too low to be enjoyable, but then again, it’s always great to be out! Colin Kinnison and Kate Lord did this trip a couple of months ago- photos to come soon! 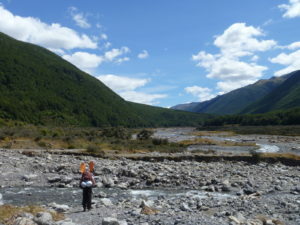 After leaving SH7 (Lewis Pass road) and fording the Boyle River continue up the valley. 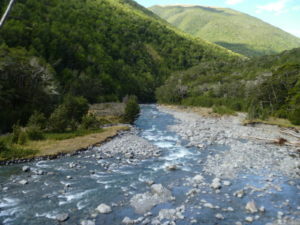 The trail follows the river up the valley allowing for scouting of rapids. The trail has washed away at some points making for some fun scrambling. 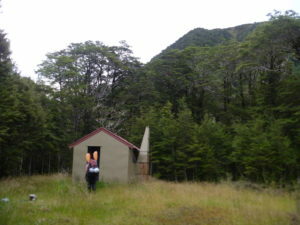 After 2 hours walking you reach Doubtful Hut. There are many lovely DOC huts but this is not one of them. It is a decrepit, leaky hut with bonus mice. It would be suggestible to either bring you tent or to walk another 2hrs up the valley to the cute and dry Doubtless Hut. We find that we walk normally to DOC suggested times but found this walk to take us 1.5 hours longer to reach Doubtless Hut. 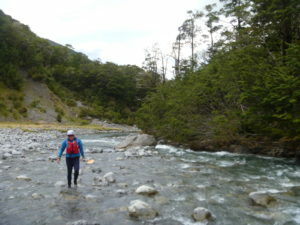 We originally planned on packrafting out from Doubtless hut. After we had inflated and started down the river we realised that this was not going to be possible due to the lack of water. This lead to an extended hike a raft on a leash period. In retrospect we concluded that starting from the confluence of Devilskin Stream provided the best paddle/water/walk ratio. 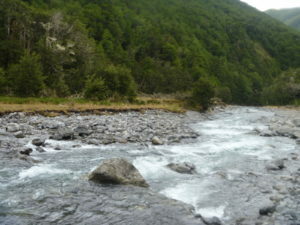 From the confluence of Devilskin stream the river consist of mainly grade 1-2+ rapids. These can all be scouted from the banks and portaged if required. This appears to be a river that would allow for some great paddling with slightly more water than what found it with- 0.64 at the Hope River at Glen Wye.